From elegant dining experiences to traditional Pennsylvania Dutch cuisine, Dining in Lancaster County is the essential guide to Lancaster County’s best eateries. 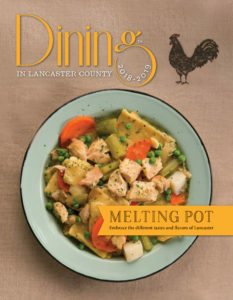 To speak to an account representative or to obtain a media kit for Dining in Lancaster County, call 717-492-2525. Dining in Lancaster County reserves the right to edit material based on its standards for publication. Advertising is subject to the publisher’s approval. Although extreme care is taken to ensure the accuracy of all content, Dining in Lancaster County and/or its advertisers are not responsible for errors or misprints. ©2018. All rights reserved. No part of this magazine may be reproduced by any process except with written authorization from the publisher. Published annually by Engle Printing & Publishing Co., Inc.